Complementary Medicine refers to certain healing methods and products that effect in combination with conventional medicine. For instance, a cancer patient getting chemotherapy may also undertake acupuncture to help copeup with side effects caused by chemo such as vomiting and nausea. Complementary and alternative medicine or CAM is alternative medicine used collectively with traditional medical treatment since it balances and increases the effectiveness of the treatment.Integrative medicine or integrative health is the amalgamation of the practices and procedures of alternative medicine with conservative medicine. It comprises of a an extensive range of health carepractices, products and therapies, stretching from being biologically conceivable but not well tested, to being openlyopposed by evidence and science, or even dangerous or lethal. Some of the new and traditional medicine practices such as naturopathy, chiropractic, homeopathy, Ayurvedic medicine, energy medicine, several forms of acupuncture,traditional Chinese medicine, and Christian faith healing. These treatments are not part of the science-based healthcare structure, and are not evidentlysupported by scientific proof. Despite significant expenditures on testing alternative medicine, almost none have revealed any efficiencymore than that of false treatments such as placebo. The Complementary Medicine certification course by Brainmeasures enables you to explore about all the elements in complementary medicine and their usefulness. Alternative medicine consists of an extensive range of health care practices, products, and therapies. Alternative medicine practices are varied in their fundamentals and policies. Alternative medicine practices may be categorized by their cultural roots or by the varieties of philosophies upon which they are built. The techniques may unite or base themselves on customary medicinal practices of a specific culture, folk knowledge, misconception,spiritual beliefs, and belief in supernatural energies or anti science, pseudoscience, publicity, fraud, new or different theories of health and sickness, and any bases other than being confirmed by scientific methods. Brainmeasures is an ISO certified company renowned for their online certifications and skill testing. After getting enrolled in this course, you would receive an E-book that would guide you for the exam. Upon successful completion of the exam, you woule be awarded the certification by Brainmeasures. The average salary of a Spa Massage Therapist is around $18,000-$45,000 whereas that of an Alternative Medicine Instructor and other Complementary Medicine Practitioners is around $30,767- $116,980 approximately. Salaries may vary depending on personal experience and qualifications of an individual. Introduces you and helps you to find out about complementary medicine. Enables you to explore traditional healing systems. How to use popular complementary therapies? How to treat your body? How to heal your mind and spirit? Helps you to understand complementary medicine. Helps you in finding about diagnosing in complementary medicine. Explains all the facts about traditional Chinese medicine. Gives a brief history and explanation about Ayurveda medicine. Discusses all about the Tibetan medicine. Discusses about Japanese medicine and therapies. Discusses about Japanese massage techniques..
Discusses about Nature cure and natural ways to restore health. Discusses about Acupuncture and the various types of Acupuncture. Discusses about Homeopathy and how it works. Discusses about the different types of herbal medicine. Explains about Nutritional therapy along with its benefits. Discusses the importance and uses of Naturopathy treatment. Explains about Osteopathy and how it works. Discusses the different types of Osteopathy. Explains about Chiropractic and its uses. Discusses all the techniques of Chiropractic treatment. Discusses about Feldenkrais technique and therapy. Explains about massage therapy and treatment with massage. Discusses about the various Breathing, Meditation and Relaxation therapies. Explains about Aromatherapy therapy treatments along with their benefits. Discusses about Crystal healing therapy Psychic healing. Discusses about Autogenic therapy AT and its benefits. Discusses about Psychological therapies and Energy medicine. Discusses about all the modern day creative therapies such as colour therapy, dance therapy, drama therapy, Feng shui, music therapy, etc. Provides you with 10 complimentary medicine tips for healthy living. Discusses the 10 superfoods for great health. The Complementary medicine online certification course is highly beneficial for all the individuals interested to enhance their knowledge and skills in the field of complementary medicine that is naturopathy, homeopathy, Ayurveda and more. Already practicing medical practitioners can also take up this online course while working at the same time. This is an added benefit of an online course since no extra time or leave is required to study this course and appear for the exam. Doctors and medical practitioners are occupied most of the time and find it hard to get any free time which can be utilized in studying extra courses to learn more and gain certifications. 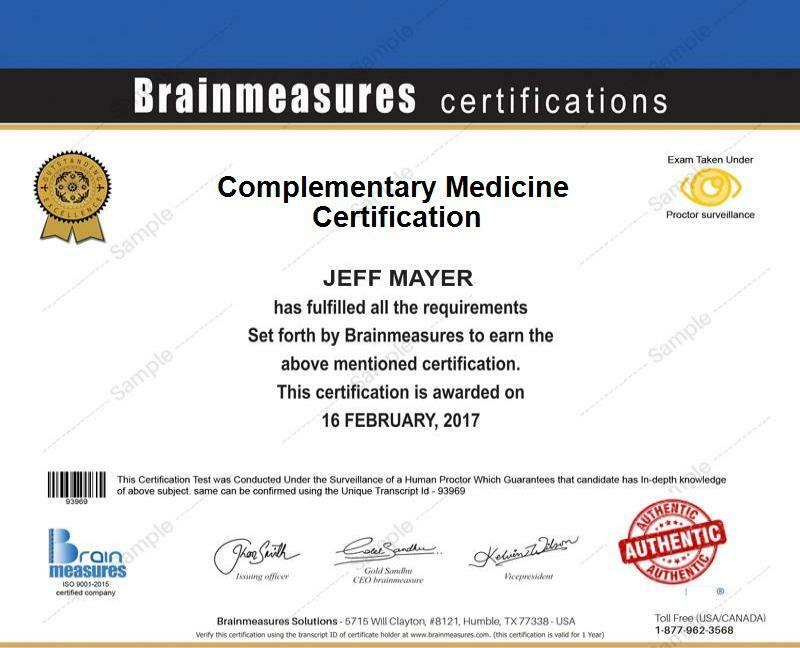 Brainmeasures gives you this wonderful opportunity to study this course, appear for an online exam and become a certified Complementary medicine practitioner. Certifications by Brainmeasures are recognized and accepted worldwide.